New York City's Department of Transportation unveiled new parking signage for city streets that promise to be less confusing for motorists. The current signs, notorious for being cluttered with information, have around 250 characters. The new signs take their cue from Twitter, using a concise 140 characters. 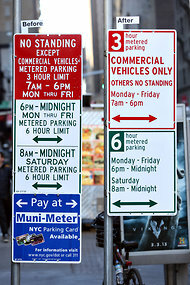 Other changes to the signage include: removal of blue "Pay at Muni- Meter" signs, the time limit allowed for parking is more prominent, and type/ arrows have been rescaled to be easier to read. According to the New York Times, city officials have been calling for a parking sign overhaul since Mayor Lindsay was in office in 1967. “Some of the signs are so bad that a motorist could be ticketed while stopping his car to try to figure them out,” the mayor said then. What do you think of the new parking signs? Is the information easier to understand, or is it just less cluttered looking ?